Zondervan has published an updated and newly designed version of this study Bible. 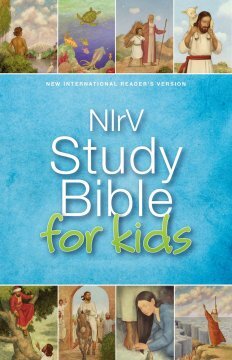 "The bestselling NIrV Study Bible for Kids starts early readers ages 6-10 on the rewarding path of reading and studying God's Word. This Bible uses the complete text of the New International Reader's Version® (NIrV) which is written at a third-grade reading level and is perfect for those learning to read." My daughter has been asking for a new "big girl" Bible for a little bit now and I was so excited to review this with her. She just turned 6 years old and is a first grader who's fairly new to reading. We loved the colorful artwork. They are just enough to remind her of her storybook Bible and the easy-to-read text lets her know it's a "big girl" Bible. We can read together and she can read some by herself as she grows more proficient over the years. Overall, it definitely gets kids to engage with the Bible in a way that makes it stick.